Atlantic Salmon Flies: Connecticut Broodstock Atlantic Salmon Season: One Hand or Two? 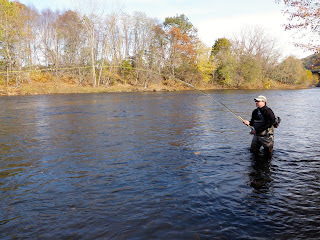 Connecticut Broodstock Atlantic Salmon Season: One Hand or Two? When I am guiding, particulairly in the early season, I'm often asked whether a single or double handed rod is appropriate. Before this four year stretch of low water, the answer was easy. Either are fine. It seems like 2017-2018 might be more like a typical year in terms of water levels. Despite having great success in low water, I'm anxious about getting back to the way it used to be. I miss using the two handed rod in the early season, even if the fish are spread out over a much greater area. During the past several years, I have focused on the lower Naugatuck River, which can be an excellent place to fish either a one to two handed rod throughout the season. I don't recommend a two handed rod for fishing the upper Naugatuck. The river is too narrow. However, single handed spey can come in handy up there. Like the lower Naugatuck, the Shetucket River can go either way. In general, it's wider than the lower Naugatuck, but with a more gentle current. 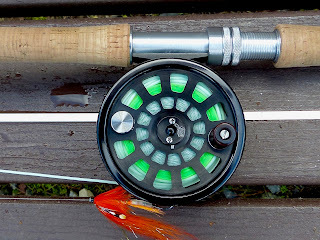 The tips below mainly reflect my experience on the lower Naugatuck, but can be tweaked and applied to the other two salmon fishing areas in Connecticut. The single handed fly rod is my tool of choice in the early season when the river is at a low-to-normal level. The lower Naugatuck doesn't have bank to bank current, so I think of fishing the runs as fishing a "river within a river." This can be more like small stream angling in that the run might only be 10-25 feet across. Long casts are usually not necessary. The only place where casting gets difficult is where the narrow band current follows the near bank. In this case, single handed spey casts or cack handed casting may be necessary due to the tree-lined banks. I like to target the inside and outside seams. Because the water flow is so weak in low water, the fly often has to be animated instead of simply swung through the run. A lot of strikes come when stripping the fly back along the inside seam. Because of this, dealing with running line and a shooting head can be a pain in the neck (more on that later). I have hooked salmon with my mono leader almost inside the tip of the guides. If nothing takes, just shake out some fly line and recast. Stripping a fly through slow water can be very effective. I prefer a smooth retrieve, be it fast or slow. I don't let the fly pause. Often times, I place my rod under my right arm and strip with two hands, even when fishing a fly slowly. I can feel as soon as the fish strikes. As opposed to waiting a moment to set the hook, like with a swung fly, I tend to tighten up right away when stripping with both hands. I find a more proactive approach gets a stronger hookset in very slow water. In any case, I find this type of fishing easier with a single handed fly rod. If I expect to fish dry flies, I will usually bring a single handed rod, though I fish them on the two hander now and then. I think I am more accurate with a single handed rod. When fishing dries, I mainly fish to known lies or spotted fish, so I want the fly to land exactly where I want it to land. 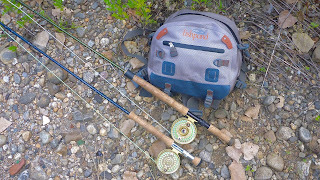 My single handed rods of choice are an Orvis Hydros 9'6" 6wt and a Sage One 9' 7wt. If I had to pick one, it would be the latter. The heaviest I go is 8 wt., but it is rare I use it since I don't often fish large, heavy flies with a single handed fly rod. When the water is right for swinging a fly, I'd much rather use a two handed rod than a single hander. A lot of anglers think it's for distance casting. It does cast further more easily, that's for sure, but it's not my main reason for using a two hander. The banks are lined with trees and can be steep. Backcast room can be limited to virtually non-existent. In this scenario, the two handed rod is definitely superior. In higher water, the current still isn't bank to bank. Again, I like to fish the inside and outside seams, but I have to reach further to do it. I also have to control a longer length of line. A longer rod makes it easier to do both. In very high water, there will be some fish lying close to the bank. Either a single or double hand rod will work, but I prefer the versatility of the double. Except in really high water, our rivers aren't really good places for traditional spey lines. We just don't need that much distance. Most of my fish are caught with modest length casts, not Hail Marys. As such, shooting heads are good choices. Either a Skagit or Scandi head will work, though I prefer the Scandi setup. Most of the time, I'm not throwing a heavy fly. The Scandi system delivers a fly with more delicacy. Also, the airborne anchor creates less disturbance on the surface of the water. One common mistake I see, most often with Skagit casters, is laying the line right over the run and ripping the anchor through water that might hold fish. With an airborne anchor (such as with the single spey or snake roll), the anchor will happen behind or alongside the angler, where fish aren't as likely to hold. As the season rolls on, it might be necessary to fish a fly deeper and slower. I used to use floating heads and polyleaders. Now, I find multiple density heads more effective, especially when it comes to slowing a fly down. Both Scientific Anglers and Rio make multi density heads. Guideline makes great heads, too, but they are hard to find in the US. A good selection of shooting heads would include a full floater, float/hover/intermediate (F/H/I), hover, intermediate, S3 (H/I/S3), and intermediate/S3/S5 (I/S3/S5). I don't use the I/S3/S4 much, as these rivers don't have heavy enough current to justify its use. I have it in case I need it, though. Of course, single handed sinking lines can be used on single handed rods, but I find it easier to extract the line from the water with a two handed rod than with a short single hander. I don't fish too long of a rod here in Connecticut. I don't often need extreme distance. My early season two hander of choice is a Sage Z-Axis 11' 6wt. I like to use a 325-350 grain Scandi head with this rod (floating). When I need a little more power, I use a different rod. This year, I'll be using a Sage TCX 11'9" 6wt. It prefers lines in the 374-425 grain range. This is the rod I use with sinking heads and when I need to cast a larger fly or throw a bit longer line. If I really need to cast far, I use a 12'6"-13' rod, but nothing longer than that. Regardless of water levels, I always travel with both single and double handed rods. When the river is at that sort of "in between"level, I might use either, or even both, depending on the pool. Be prepared. It's better to have it and not use it, then to need it and not have it. A lot of anglers so desperately want to use the two handed rod that they neglect the effectiveness of the single hander in certain conditions. For me, the job is fun, regardless of the tools needed.